The NSF’s publicity stunt: 2026 Idea Machine. Let’s say, you want to collect as many good ideas as possible. “Brainstorming 101” (critical thinking, lateral thinking, ideas solicitation, knowledge elicitation) tells that first you need to collect as many ideas as possible. Then you can start analyzing and ranking them (based on your own scale). At the first stage of the process, the sources of the ideas do not matter. The only reasonable constrain is the time, because eventually you will have to switch from the phase one (collecting the ideas) to the phase two (analyzing the ideas). To realize this approach, “Management 101” requires to decouple the ideas from their sources, to make the ranking anonymous. The simplest way to decouple an idea and its source is to assign a unique identification code to each source (an author, or a team) and to the idea represented by that source (of course, the idea and the source of that idea must have the same identification code assigned to both of them). Then the ideas (with their identification codes) are forwarded to the next stage, i.e. ranking. When ranking is finished, the identification code allows to reestablish the sources (the author or the team) of each selected idea. BTW: If this procedure would have been used by the government when children have been separated from the parents, at least they could have been reunited much quicker. But some government agencies seem not familiar with “Management 101”. The NSF also decided not to use this procedure for its 2026 Idea Machine competition. This is a possible conversation on the matter. “ - We have to limit one entry for one person or team, or we will be swamped with the ideas. - But what if the same team or a person would have more really good ideas? - So what, we don’t do it for finding good ideas, we do it to show the public that we do something for the public and from the public, not just for our top research groups and universities. All we need is a dozen of nicely presented ideas. - But I wouldn't expect many people submitting many ideas, not everyone is Albert Einstein, or Isaac Asimov, and most people would rather focus on one project anyway. This was a “Psychology 101” reconstruction of the people’s motives based on the people’s actions. One can argue that the reason for “one source – one entry” rule is that people cannot effectively manage more than one project. Firstly, that is not true, otherwise there would be no professionals titled “a manager”. Secondly, “Logic 101” tells that “one source – one entry” and “one person – one project” are two different rules. If the NSF would want to enforce “one person – one project” rule, it could have been easily done on the phase three – awarding. Let’s say, three ideas were selected on the phase two, and then the identification codes revealed that they have the same source (a person, a team). The NSF could make a demand to the author(s) to choose one of the three, at least for the immediate support. Since the actual approach was very different from the optimal one, and I mean the approach which would optimally satisfied the stated mission, I make a conclusion that the stated mission and the actual mission are two different missions. That is why I made a conclusion that the NSF’s 2026 Idea Machine competition is just a publicity stunt. One may wonder, why did I sent my applications if I knew I would be disqualified? Well, I did not want to participate in a publicity stunt. But I did want to reveal that is was just a stunt. This is my second major interaction with the NSF. The first one was about two years ago, when I wrote a paper proving that instead of financing research in the field of education, the NSF finances various social projects in that field. The mission of the NSF is advancing sciences. For example, financing the research on the best engineering practices or materials for building roads would be fine. But no one would expect that the NSF would use money to finance building roads. And this is exactly what the NSF does in the field of education – “building roads”. Since I have a paper on this matter, I will guide everyone who is interested in more details to that paper. The NSF is a governmental agency using a vast amount of public funds. For example, a project manager at the NSF is paid $160 K a year, plus benefits. Good governmental benefits. That is a lot of taxpayers' money. I believe the taxpayers need to know more about how the NSF operates, and be involved deeper into how the NSF is being managed. The mission of the NSF is advancing sciences. Science, as a human practice, has its own mission, which is making reliable predictions. Reliable predictions represent the pinnacle of sciences. All other activities are supposed to lead to that. That means (in part) that instead (or at least in addition to) the "research question" (which often just very trivial) NSF needs to require from grantees to state what reliable prediction(s) will be able to be done (as a hypothesis) based on the result of the proposed research. People who do sciences - scientists - have their own mission, which is discovering and revealing the truth in a form which allows making reliable predictions. This article is not a scientific paper, it does not allow making reliable predictions. But it is a work of a scientist with the goal of revealing the truth. Naturally, people may disagree with the content of this piece. But if you, the reader, disagree, don't just say that. Lay down you counter arguments in a logical manner. I know I am not the "Knight Ridder", but I try to represent people who may have different logical interpretations to the events important to them. And that is why I started this little project and wrote this paper. I am not an idiot or a reckless person. The reason I can allow myself writing what I think, even if that may be critical to rich/powerful person/group, is that my financial situation is sufficient and stable. Of course, I wouldn't mind making more money or be involved in specific educational projects (as described in my generic resume). But I do not have to pretend to be someone I am not to make my living. I am aware of the fact that my chance to join an American team is slim. The demand for "professional correctness" is taken to such an extreme that it has become the demand for personal conformity. I also know that the chance of my writing to have any effect is almost zero. But if the things are not getting any better, at least I know - I tried. Appendix II: my communication with the NSF 2026 Idea Machine. 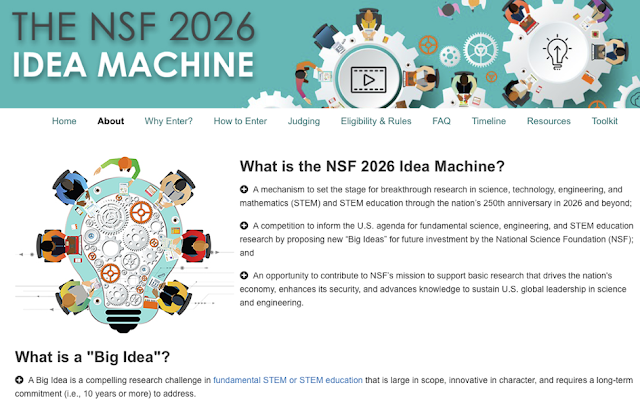 It has come to our attention that you have submitted multiple entries to the NSF 2026 Idea Machine competition, using multiple different email addresses. The rules state that only one entry per individual or team is allowed (see https://www.nsf.gov/news/special_reports/nsf2026ideamachine/eligibilityandrules.jsp). Therefore, as also indicated in the rules, you as a contestant and all of your entries have been disqualified. • Residing legally in the U.S. on September 1, 2018.
and did not expect any other response. However, now, I would like to use this opportunity to point at the fact that the rules themselves are essentially against the very idea of a scientific progress. Science knows numerous examples when the same person had big ideas in different areas (take Albert Einstein, as the most famous example). If the NSF would be really seeking new big ideas it would embrace as many ideas as possible. Instead, the NSF decided to demonstrate a publicity stunt. I believe this example demonstrates once again how rigid and formal the NSF has become.